A fascinating paper, titled “Noninvasive Deep Brain Stimulation via Temporally Interfering Electric Fields,” was published in the June 1 issue of Cell (Volume 169, Pages 1029–1041) by Nir Grossman and his colleagues. Although I don’t agree with everything the authors say (I never do), on the whole this study is an important contribution. You may have seen Pam Belluck's article about it in the New York Times. Below is Grossman et al.’s abstract. We report a noninvasive strategy for electrically stimulating neurons at depth. By delivering to the brain multiple electric fields at frequencies too high to recruit neural firing, but which differ by a frequency within the dynamic range of neural firing, we can electrically stimulate neurons throughout a region where interference between the multiple fields results in a prominent electric field envelope modulated at the difference frequency. We validated this temporal interference (TI) concept via modeling and physics experiments, and verified that neurons in the living mouse brain could follow the electric field envelope. We demonstrate the utility of TI stimulation by stimulating neurons in the hippocampus of living mice without recruiting neurons of the overlying cortex. Finally, we show that by altering the currents delivered to a set of immobile electrodes, we can steerably evoke different motor patterns in living mice. The gist of the method is to apply two electric fields to the brain, one with frequency f1 and the other with frequency f2, where f2 = f1 + Δf with Δf small. The result is a carrier with a frequency equal to the average of f1 and f2, modulated by a beat frequency equal to Δf. For instance, the study uses two currents having frequencies f1 = 2000 Hz and f2 = 2010 Hz, resulting in a carrier frequency of 2005 Hz and a beat frequency of 10 Hz. When they use this current to stimulate a mouse brain, the mouse neurons respond at a frequency of 10 Hz. The paper uses some fancy language, like the neuron “demodulating” the stimulus and responding to the “temporal interference”. I think there is a simpler explanation. The authors show that in general a nerve does not respond to a stimulus at a frequency of 2000 Hz, except that when this stimulus is first turned on there is a transient excitation. I would describe their beat-frequency stimulus as like the turning on and off of a 2000 Hz current. Each time the stimulus turns on (every 100 ms) you get a transient response. This gives you a neural response at 10 Hz, as observed in the experiment. 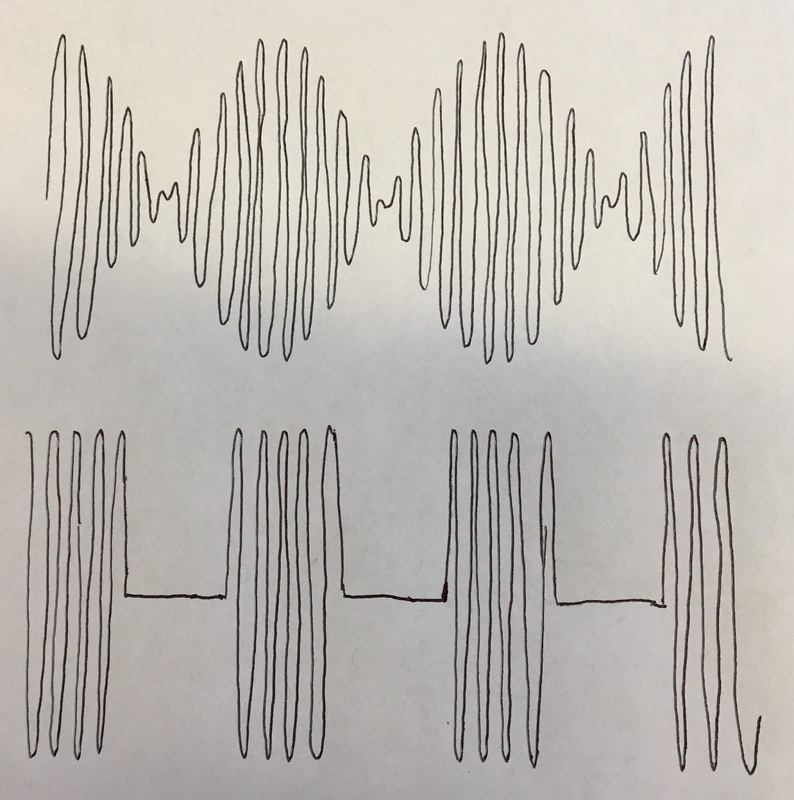 In other words, a sinusoidally modulated carrier doesn’t act so differently from a carrier turned on and off at the same rate (modulated by a square wave), as shown in the picture below. The transient response is the key to understanding its action. Stimulating neurons at the beat frequency is an amazing result. Why didn’t I think of that? Just as astonishing is the ability to selectively stimulate neurons deep in the brain. We used to worry about this a lot when I worked on magnetic stimulation at the National Institutes of Health, and we concluded that it was impossible. The argument was that the electric field obeys Laplace’s equation (the wave equation under conditions when propagation effects are negligible so you can ignore the time derivatives), and a solution to Laplace’s equation cannot have a local maximum. But the argument doesn’t seem to hold when you stimulate using two different frequencies. The reason is that a weak single-frequency field doesn’t excite neurons (the field strength is below threshold) and a strong single-frequency field doesn’t excite neurons (the stimulus is so large and rapid that the neuron is always refractory). You need two fields of about the same strength but slightly different frequencies to get the on/off behavior that causes the transient excitation. I see no reason why you can’t get such excitation to occur selectively at depth, as the author’s suggest. Wow! Again, why didn’t I think of that? A good paper raises as many question as it answers. For instance, how exactly does a nerve respond to a beat-frequency electric field? I would like to see a computer simulation of this case based on a neural excitation model, such as the Hodgkin-Huxley model. 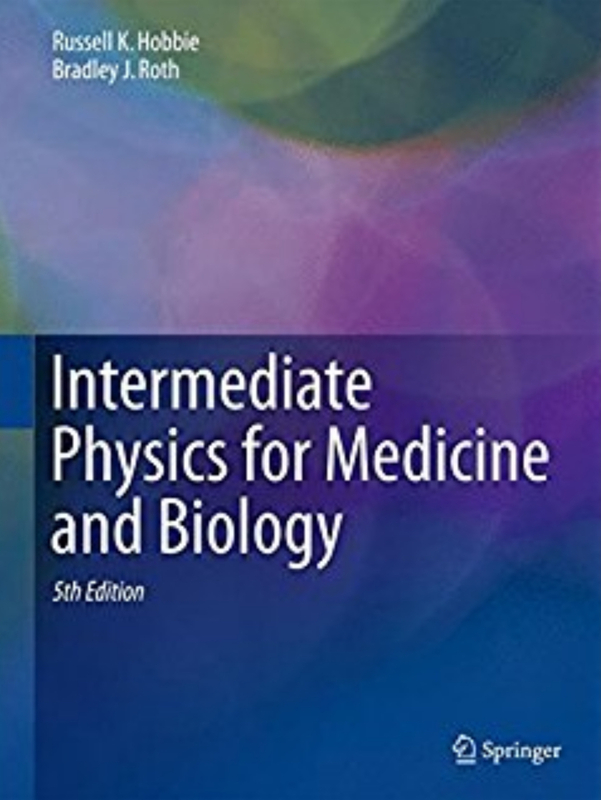 (You can learn more about the Hodgkin-Huxley model in Chapter 6 of Intermediate Physics for Medicine and Biology; you knew I was going to get a plug for the book in here somewhere.) Also, unlike long straight axons in the peripheral nervous system, neurons in the brain bend and branch so different neurons may respond to electric fields in different (or all) directions. How does such a neuron respond to a circularly polarized electric field? When I first read the paper’s final sentence—“We anticipate that [the method of beat-frequency stimulation] might rapidly be deployable into human clinical trials, as well as studies of the human brain”—I was skeptical. Now that I’ve thought about it more, I willing to…ahem…not dismiss this claim out-of-hand. It might work. Maybe. There is still the issue of getting a current applied to the scalp into the brain through the high-resistance skull, which is why transcranial magnetic stimulation is more common than transcranial electric stimulation for clinical applications. I don’t know if this new method will ultimately work, but Grossman et al. will have fun giving it a try. Thanks for the great post. And wow, what timing. 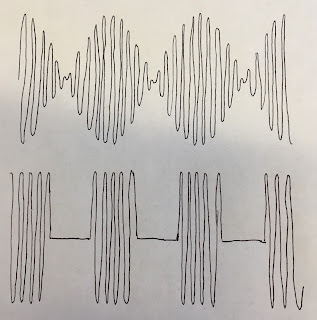 Still inspired by a 1980s premed course with IPMB, maybe ~ two decades ago, in private correspondence with you, I believe I proposed that we try this very technique on peripheral nerves for achieving conduction block for clinical anesthesia. It's never too late Dr. Roth. Beautiful memories of IPMB still live on. I even bought the 4th edition.